A.M. Cozzens, New York, by 1855. purchased by William Wilson Corcoran [1798-1888], Washington; gift 10 May 1869 to the Corcoran Gallery of Art, Washington; acquired 2014 by the National Gallery of Art. Thirtieth Annual Exhibition, National Academy of Design, New York, 1855, no. 63. A Souvenir of Romanticism in America; or An Elegant Exposition of Taste and Fashion from 1812 to 1865, Baltimore Museum of Art, 1940, unnumbered checklist, as Scenery on the Magdalena River. Romantic America, Columbus Gallery of Fine Arts, Ohio, 1948, no. 8. 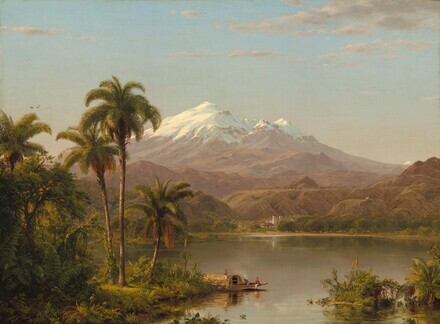 Past and Present: 250 Years of American Art, Corcoran Gallery of Art, Washington, 15 April-30 September 1966, unpublished checklist, as Scenery of the Magdalena River, New Granada, South America. The Painter and the New World, Montreal Museum of Fine Arts, 1967, no. 334. Corcoran [The American Genius]. Corcoran Gallery of Art, Washington, 1976, unnumbered catalogue, as Scenery of the Magdalena River New Granada, South America. Close Observation: Selected Oil Sketches by Frederic E. Church, Corcoran Gallery of Art, Washington; Cooper-Hewitt Museum, New York, 1979-1980, not on checklist. American Luminism, Adams Davidson Galleries, Washington, 1980, no. 21. Frederic Edwin Church, National Gallery of Art, Washington, 1989-1990, no. 22. Louis Remy Mignot: A Southern Painter Abroad, North Carolina Museum of Art, Raleigh; National Academy of Design, New York, 1996-1997, unnumbered catalogue. Encouraging American Genius: Master Paintings from the Corcoran Gallery of Art, Corcoran Gallery of Art, Washington; Museum of Fine Arts, Houston; Parrish Art Museum, Southampton; Mint Museum of Art, Charlotte; John and Mable Ringling Museum of Art, Sarasota, 2005-2007, checklist no. 25. Kelly, Franklin. "Frederic Edwin Church, Tamaca Palms." In Corcoran Gallery of Art: American Paintings to 1945. Edited by Sarah Cash. Washington, 2011: 24, 108-109, 262, repro.